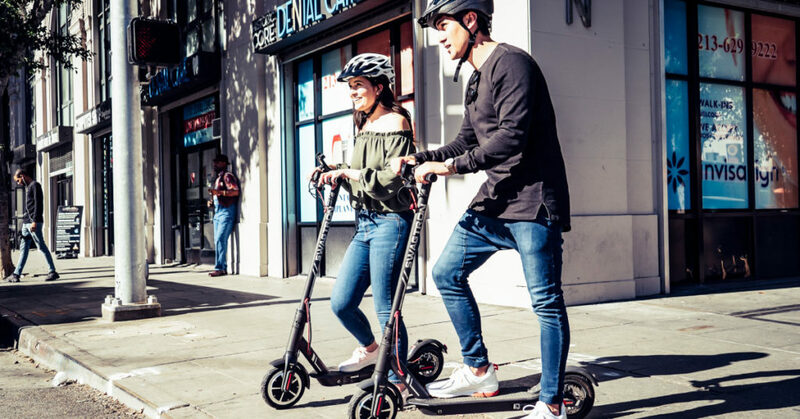 Riding an electric scooter or eBike is an exhilarating and empowering experience. For riders with mobility issues, it can open up more of their neighborhood for exploration. For students with a demanding college schedule, it means the getting to class with tie to spare. For those working in the city, it could make commuting more bearable and, in a lot of cases, affordable. Though exhilarating, riding should be treated with respect. Riders should take precautions to minimize the possibility of injury. That includes age-appropriate knee and elbow pads and, the subject of this article, a good helmet. No, scratch that — a great helmet! The best helmet you can find! It is, after all, you’re protecting your dome (or a loved one’s dome). Nothing is more important. 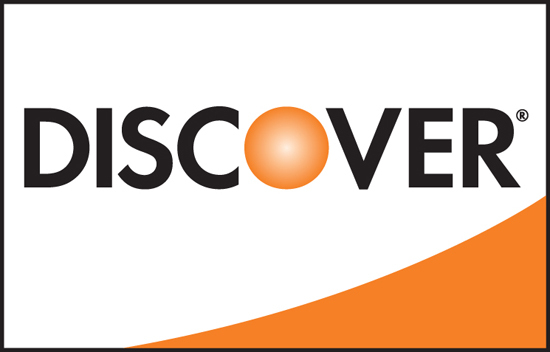 We’re passionate about helping riders and parents protect what matters most. When it comes to riding, the best way to do this is by wearing a helmet. An unexpected fall from a bike or scooter — electric or otherwise — can happen at any time. And such a fall has the potential to result in serious brain trauma. Certified helmets that fit the rider perfectly can help reduce this risk. Everybody should wear a helmet every time they ride on a bike or scooter — adults and especially children. But it’s not enough to just wear a helmet. It needs to fit properly, otherwise it won’t provide the optimal protection against head trauma. Don’t see one of these seals on a helmet? Avoid like the plague! Ideally you would want to try on helmets before buying it. This is to make sure that the helmet fits nice and snug. Helmets should not be able to move side to side. Some newer models come with sizing pads. 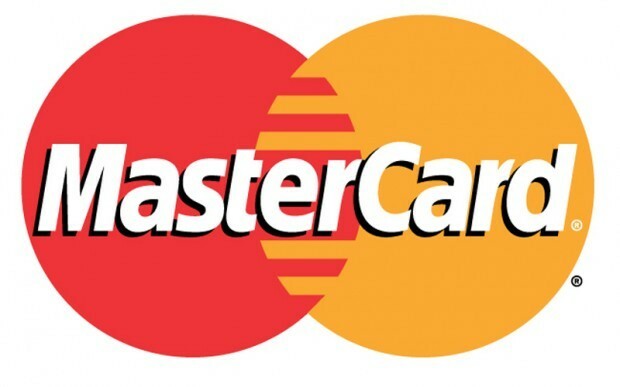 If you need a more secure fit, these can come in handy. These let you “size-up” a bit if you’re buying for your kid. But we don’t necessary recommend that. 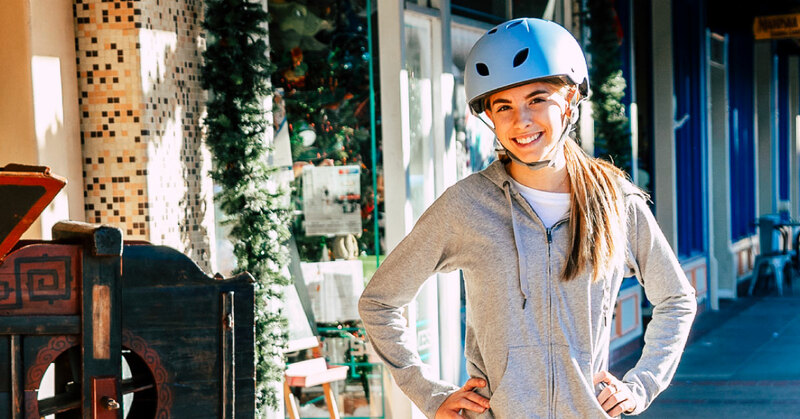 Your child’s helmet should fit their head — now. While trying on a helmet before you buy it is ideal, it’s not always possible. If you’re buying from an online vendor, you’ll want to find the proper size to buy. The best way to do this? Wrap a flexible tape measure around the largest portion of your head. This is usually about 1 inch above your eyebrows — but every head is different. No flexible tape measure on hand? No problem! Wrap a string or ribbon around your head. Mark where the end of the string connects. Then measure the string with a ruler. Sometimes when you’re buying a helmet, the vendor may use size designations like “small,” “medium,” or “large.” This doesn’t do us much good. 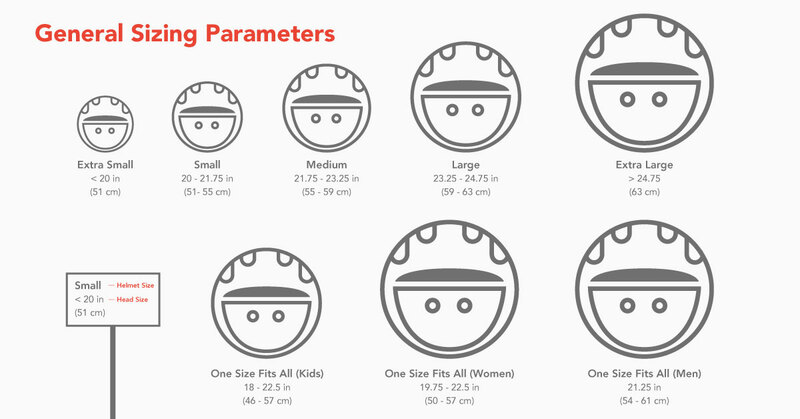 So use the chart below to translate and grab the helmet size that perfectly matches your measurement. 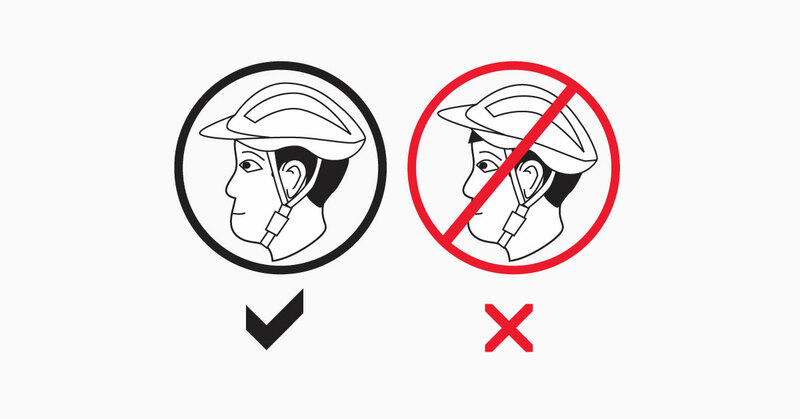 Remember: The helmet should fit snugly with little-to-no movement once on the head. (But don’t make it so tight that it cuts off circulation.) So if you find that you’re between sizes, always opt for the smaller size. And if buying for your child, take their measurements again every six months or so, depending on how fast they’re growing. Almost as important as the size of the helmet is how it positions on the head. Helmets should sit low and cover your forehead. You should only be able to fit one or two fingers above your eyebrow. And while the helmet should sit low, it shouldn’t be so low that it obstructs vision. You should be able to see the front rim of the helmet when you look up. Make sure the helmet covers the top of your forehead without tilting forward or backward. The straps should form a V shape under each ear. 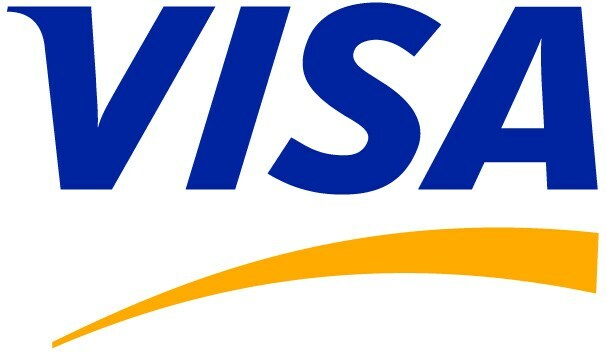 The left- and right-side straps should form a “Y” and meet right below your ear. The side straps may be easier to adjust if you take the helmet off your head. Roll the little rubber band as close to the side straps as possible to prevent slipping. Buckle the chin strap. Tighten it until it is snug. It needs to be snug but comfortable beneath your chin. You should be able to fit no more than one finger between your chin and the straps, which should form a “V” under each ear. To test, open your mouth wide while the chin strap is buckled. The helmet should press against the top of your head. Perfect fit! One of the last things you’ll want to do is give your helmet a little jiggle. With the helmet on, shake your head back and forth, left and right. If the helmet shifts noticeably when you shake your head, then try re-adjusting it. If the helmet’s a perfect fit, then it won’t move more than one inch or so in any direction when you shake your head left-right, front-back. If it does move more than an inch, then it’s not the right fit. Try a smaller size. Remember to Replace the Helmet When . . .
You’ve crashed in the helmet. Your child — or you (no judgments!) — has outgrown the helmet. The helmet has dropped onto a hard surface, like concrete. 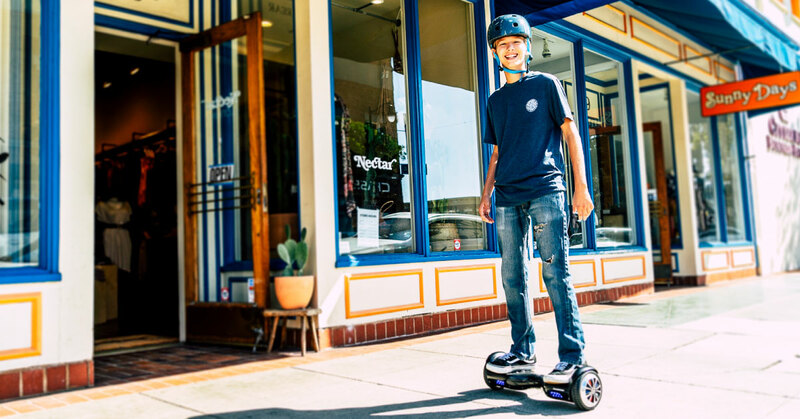 Wearing protective gear is important when riding any scooter or bike — electric or otherwise. And finding the perfect fit is crucial to maximizing the protection given by a helmet. Using these five steps, you’ll quickly find the right helmet at the right size.